PHILADELPHIA (WPVI) -- Beginning Jan. 22, 2018, Pennsylvania residents wanting to board a flight may need another form of identification than their driver's license. A Pennsylvania driver's license will not be a proper form of identification for domestic air travel starting on that date due to the state not being compliant with the REAL ID Act. Other states not in compliance include Kentucky, Maine, Minnesota, Missouri, Montana, Oklahoma, South Carolina and Washington. Delaware is compliant. New Jersey has an extension which allows federal agencies to accept driver's licenses until Oct. 10, 2017. Last week, the TSA began posting signs at airports to notify travelers of the January 2018 change. 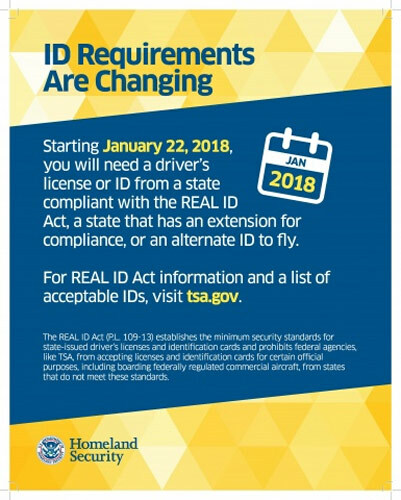 According to the Pennsylvania Department of Transportation, the state does not meet the REAL ID requirements due to legislation. "Our commonwealth does not currently meet these federal standards due to the passage, by the Pennsylvania General Assembly, of Act 38 of 2012, which bars the Governor and PennDOT from participating in REAL ID," PennDOT states on their website. This act shall be known and may be cited as the REAL ID Nonparticipation Act. Section 2. 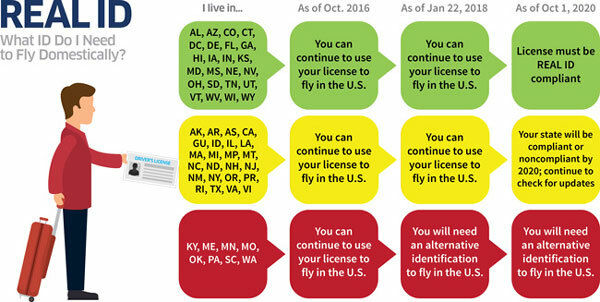 Participation in the REAL ID Act of 2005. (a) Prohibition.--Neither the Governor nor the Department of Transportation or any other Commonwealth agency shall participate in the REAL ID Act of 2005 or regulations promulgated thereunder. (b) Definition.--As used in this section, the term "REAL ID Act of 2005" means Division B of the Emergency Supplemental Appropriations Act for Defense, the Global War on Terror and Tsunami Relief, 2005 (Public Law 109-13, 119 Stat. 302). Either the Governor or the Attorney General may file an action in a court of competent jurisdiction to challenge the constitutionality or legality of the REAL ID Act of 2005. PennDOT says they are out of compliance not only because of existing state law, but due to "limited technical reasons." "PennDOT has always focused on providing a secure driver's license and supporting process and we already have made additional improvements," PennDOT Secretary Leslie S. Richards said in a statement in October. "In large measure, we are out of compliance for limited technical reasons and because existing state law bars us from fully complying. While we understand frustration with the cost of this unfunded federal mandate, our failure to comply because of the prohibition of current law will be a burden for Pennsylvanians." Speaking to 6abc Action News on Wednesday, PennDOT confirmed nothing has changed in regards to the state law preventing Pennsylvania from taking part in REAL ID. In a statement issued at the beginning of 2016, Secretary of Homeland Security Jeh C. Johnson said, "So, for a license or identification card to be REAL ID compliant, the state issuing it must, for example, incorporate anti-counterfeit technology into the card, verify the applicant's identity, and conduct background checks for employees involved in issuing driver's licenses." Johnson says the overall goal of the REAL ID Act is to prevent fraudulent issuance and uses of driver's licenses and identification cards. While a Pa. driver's license will not allow a passenger to board a flight come Jan. 22, 2018, the impact of the REAL ID Act will be felt much sooner - this January. Beginning on Jan. 30, 2017, a Pennsylvania driver's license will not be a valid form of identification for those visiting a federal facility, nuclear power plant or military base. Pennsylvania residents will need a federally-approved form of identification to access those buildings and facilities. "If you will be visiting a federal facility, nuclear power plant or military base on or after January 30, 2017, it is recommended that you contact that particular facility concerning any additional identification requirements," PennDOT says. While airline passengers from Pennsylvania and eight other states will be affected come January 2018, every traveler from every state will need a REAL ID-compliant license, or other form of acceptable identification, for domestic air travel beginning Oct. 1, 2020. 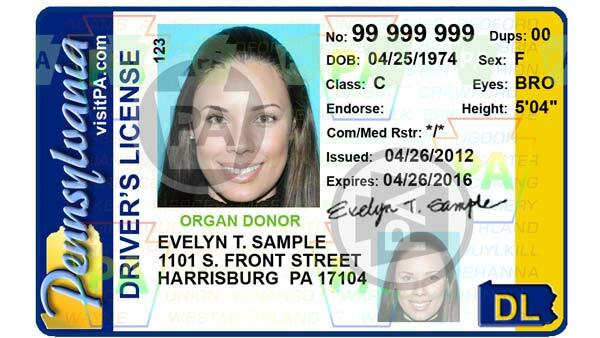 So what can you use instead of a Pennsylvania driver's license? But for now, until Jan. 22, 2018, to be specific, residents of all states - including Pennsylvania - will still be able to use a state-issued driver's license or identification card for domestic air travel.